Holey Suit, to the escape pod! I thought I’d post about Holey Suit – my little summer project & a break from Dungeon Scroller! Born whilst “attempting” GMTK Jam, this quickly became a nice little game which I decided to pursue, and planning to publish to itch.io soon. This post will take you through my thought process, and showcase how I turned a jam entry to a full fledge epic space survival game! For those who do not know what GMTK is and haven’t read my previous post: my indie resources, Game Maker Toolkit is a YouTube channel by Mark Brown. Mark is a game journalist and his channel is a great source of inspiration for game developers. After running the channel successfully for over a year, he decided to host a jam. When it was announced, I signed up for the GMTK Jam as I am a huge fan of the channel. Jams are a challenge for me, mainly because of lack of time. I have a full time job so any minute spent on a jam is time not spent working on my projects, so it takes a lot for me to join one! My previous attempt was a few months ago for the Butterscotch Shenanigans’ Shenanijam, studio I am a huge fan of. Time was a big problem for the GMTK Jam, as it fell in the middle of a vacation. Having spent a gruelling weekend on the Shenanijam, I knew it would be impossible for me to produce something viable unless I have at least a full day to focus. Chances I would partake were slim! So I went rogue: two weeks ahead of the jam, I picked my favourite GMTK videos (the theme would come from one of them) and put a prototype together. Even though I might not be able to participate officially, I could still have a go at testing an interesting design idea. I had this idea for a while of a character whose only mean to move was to shoot. Shooting would throw the player backwards, which had the potential for interesting combat/movement mechanics. Shoot at an enemy may eliminate an instant threat but pushes the player the opposite direction and place the hero somewhere even more dangerous! And then I had it: gravity. Or actually the lack of! In a place with no gravity, it would be logical that the player would be kicked back on shooting! Remember that lift scene in the Total Recall remake? This also meant the background would be very easy to draw. Space only requires a solid background and a few dots! That was it: the game would be in space, the player would be shooting to move and evade enemies. The rest came up pretty quickly. After a bit of a struggle getting the code saving the star onto a surface and push to background, the next bit was making the void of space more interesting. Why is the player in space, with only a laser gun to direct himself? I then thought of a “wrecked in space” situation – the ship has blown up by aliens and the player has to make its way to safety. Bits of the ship are flying around and act as obstacle, and the player would navigate around by shooting his laser. All of this was a pretty simple concept, and it was relatively easy to put in place within a jam time constraint. 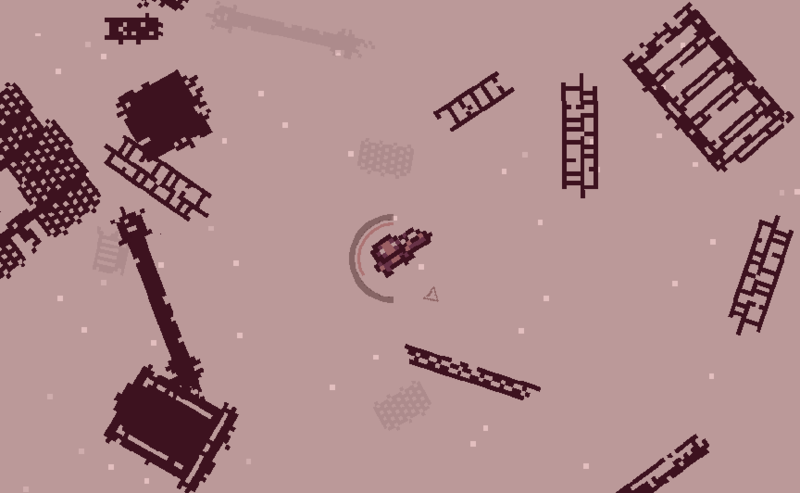 By that point I had a working prototype, done under a dozen hours which would have made for a decent jam entry. The next phase evolved to maturing the concept and polish the gameplay. At this stage I knew I would definitely not be able to submit the game to GMTK jam (the jam denied reusing material and it didn’t feel right anyway) but I thought I had a good little game worth pursuing as a side project. Since this was to be a sci-fi game, I borrowed a concept of an previous prototype. I had a previous idea of a futuristic game with lasers and no ammo. Since the game is all about lasers, instead of standard ammo shooting uses energy which slowly regenerates. This is great because it means the gameplay & GUI remains simple: no need for counters, ammunition boxes and player running out of ammo. The energy routine was easy to code and pretty much acted up as a weapon cool-down, forcing players to be strategic rather than shooting around willy nilly. I wanted the game to have multiple weapons, which posed the next problem to solve. I didn’t want the game to evolve into an upgrade loop where player upgrades / buys new weapons. With that design old weapons are discarded as soon as the next one is purchased. I really wanted each weapon to play and feel different, and all have their own weakness & strengths! Inherently, what I really wanted to implement was a Super Crate Box mechanic. 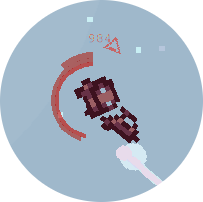 I know, there are a lot of Vlambeer influences in Holey Suit! That game is simply elegant: collecting crates hands you a random weapon, each forcing a different play style. But each time you risk ending up with a rubbish weapon. However picking crates up is the only way to score, so the player is forced to do it. No point camping in a corner with the bazooka – this won’t get your score any higher! If I wanted to emulate a similar mechanic, I would need a reason for the player to pick up boxes. This is when I came up with the concept of cool-down + battery. The idea was the player’s battery capacity would also deplete over time, same as the oxygen level. The energy would still regenerate, but only as high as the declining battery max charge would allow. Since this would eventually go down to zero – the player had to keep switching weapons to remain able to shoot. Voila! My next challenge was implementing death in Hokey Suit, and somehow linking this to the energy mechanic. What was the link? Interestingly I came up with the idea whilst swimming at my local pool! The link came to my mind as I was doing one lane too many and gasping for air: what if the oxygen ran out quicker when the energy level was down to zero? That made sense! The suit’s energy not only fuelled the gun but also the life system. Which meant the player had to be super careful going gun-ho, shooting in all direction and running our of oxygen faster! I also came up with the name shortly, out of the oxygen mechanic as your life line. Why does it run out? Your suit has holes in it of course! Holey Suit! Maybe not the catchiest name, but it somewhat stuck. Download rates on itch.io will confirm whether this is a good choice!!! Incidentally – the GMTK video I picked as a theme was indeed the official theme for the game: Downwell’s dual design, or how a single mechanic can serve multiple purpose. I guess I was attracted to it for its elegance and simplicity, but it also made for a great jam theme and obviously an easy pick. Although I failed to officially participated to the jam, I still built a game out of the official theme. Within a Jam time constraint, I managed to put something fun together. However I feel it was only allowed to mature to an actual game because I carried on and spread its development afterwards. As always, I value any feedback – if you have comments please feel free to share!